Home Society Culture What hath red culture wrought? What hath red culture wrought? 30 years after its opening, the Teresa Carreño Complex is mostly used for government acts. This article from the cultural magazine Arcadia gives us a glimpse of how the arts in Venezuela have been transformed in the times of the comandante eterno. For one thing, it shows how cultural spaces like the Teresa Carreño Theater (which turned 30 this year) has shifted its role to host now public acts of government and political rallies. In the process, its traditional programming has suffered. 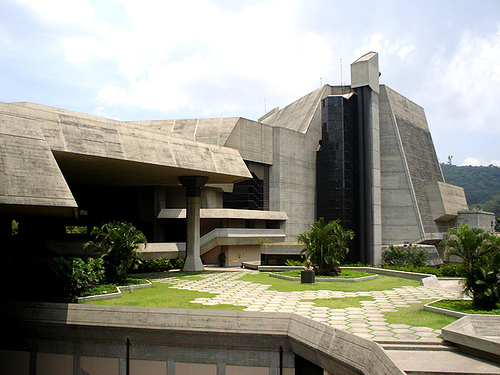 It also presents other cases like the decline of the Caracas’s Museum of Contemporary Art or the transformation of the Monte Avila publishing house into a propaganda mill. There was a similar case of political intervention in the local arts this month, but this time at the movies: Shortly before its opening, all showings of the thriller Esclavo de Dios (Slave of God) were forced by the Venezuelan film agency (CNAC) to put in front a short film about the Israeli-Palestine conflict without the approval of the film’s director Joel Novoa. Some official voices considered that “Slave of God”, which was inspired by the 1994 AMIA bombing in Buenos Aires and deals with the issue of extremist terrorism, has a pro-Israel agenda. The director has denied such allegations and even considered to withdraw the film from theaters as a form of protest. At the time of this post, the film is still showing. But the red cultural offensive continues, as mayor of West Caracas (and former CNE President) Jorge Rodríguez wants to change the Caracas Anthem so the people “…can breathe the comandante supremo“. Well, that sounds plausible. As he also attacked one of the anthem’s authors, musician José “Chelique” Sarabia, it made me wonder if the next step for them is to follow the example of Uzbekistan.